a new world of efficiency and productivity. 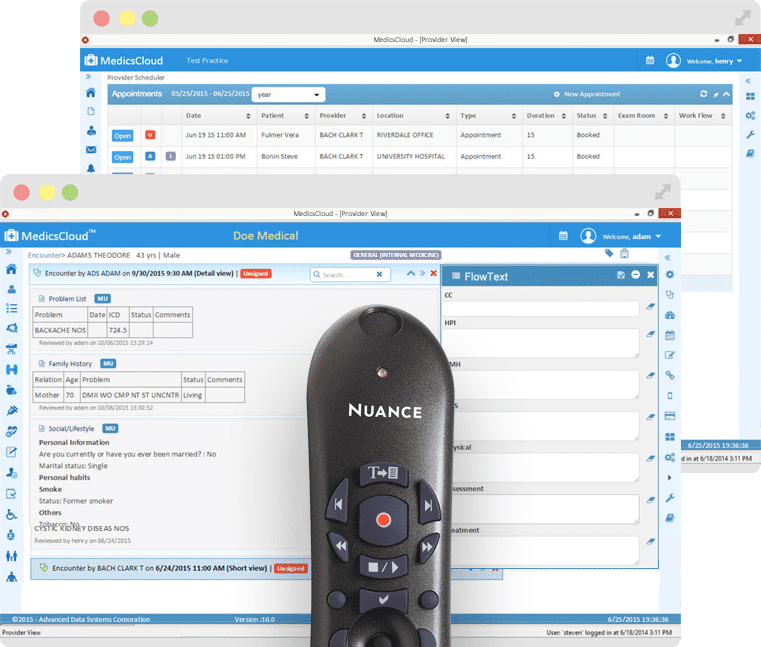 Clean and highly visual, the MedicsCloud Suite takes the encounter to new levels of efficiency with data which can be entered via quick clicks on an iPad™, and with transparent functionality using iPhone™, Android™, or virtually any other internet enabled handheld device. 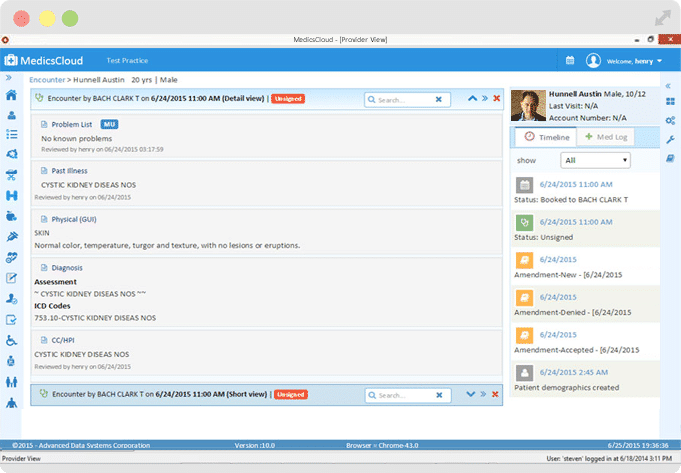 Of course, desktops, laptops, and tablet PCs can also be used to access the MedicsCloud Suite. The system’s WindowOne architecture places commonly-needed data in virtually every window view in the MedicsCloud Suite, eliminating having to “hunt and peck” to find it. The system also has specialty-specific templates with Quick Dictionaries and Vocabulary “Wizards” applicable to the specialty resulting in optimum productivity and ultra-enhanced workflow. 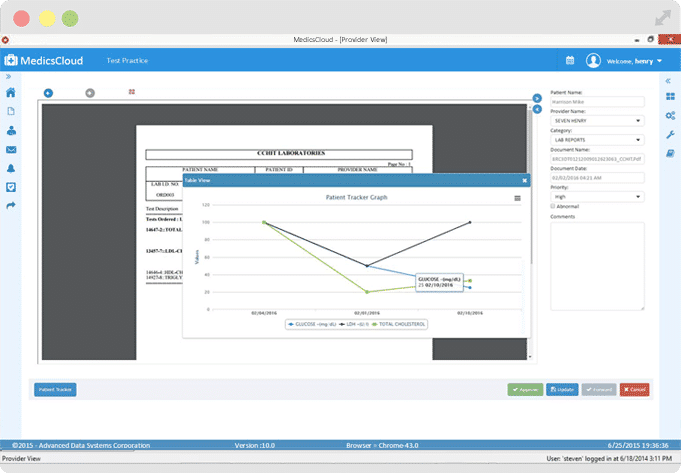 Medics FlowText is built-into the MedicsCloud EHR and changes how dictated text is placed into the patient’s record. Working with Dragon Medical™, Medics FlowText inserts transcribed text automatically into the correct fields in the patient’s record as part of the dictation. Medics FlowText also supports general voice navigation throughout the EHR which has built-in handwriting recognition as well for making notations on electronic images, for signing documents, and so much more. MedicsPortal gives your patients a secure 24 x 7 x 365 connection to the practice for accessing their data and communicating with your staff. 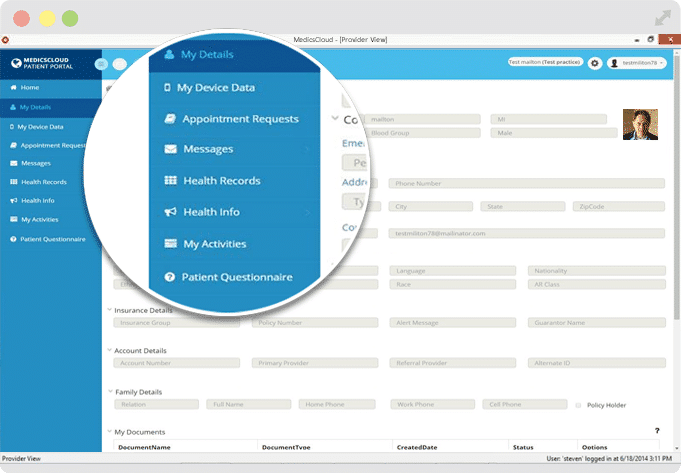 Patients can use the portal to request appointments and prescription refills, view lab results, and more. Additionally, alerts such as appointment reminders and lab results becoming available can be transformed into quick, electronically secure messages. The Certified MedicsCloud EHR is able to help move your medical practice into Value-Based Care with its ability to report on MACRA / MIPS / APMs. The system can be used for a number of other Medicare-related initiatives including Comprehensive Care Management (CCM) and Transitional Care Management (TCM). "When a patient’s record is opened, virtually any and every piece of information needed on the patient becomes immediately available. Medications prescribed, test results, images, allergies, previous visit details…all of this is easily viewed directly from the patient’s record. The system is a pleasure to use, and the ROI it produces in terms of eliminated redundancy and manual drudgery is extraordinary." 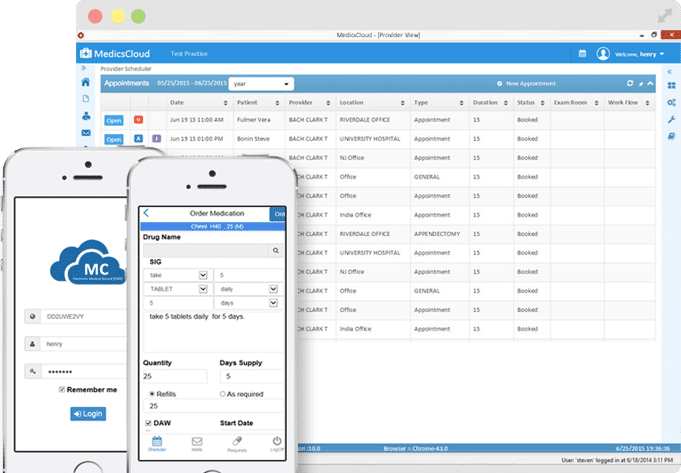 The MedicsCloud Suite is successfully utilized by medical practices to track clinical trials and to report on clinical trial data as required. Practices can help patients who are candidates for clinical trials; practices can often obtain very significant clinical trials revenue. The ideal, in-office solution for patients who didn’t use MedicsPortal in advance, or who have information to update once they arrive. MedicsKiosk is accessible via tablet, laptop, or desktop PCs, eliminating clipboards of paper and manual entry of data into the system by staff. MedicsRx enables your medical staff to keep an electronic record of each prescription, letting you transmit it to the pharmacy before the patient gets there. It handles the secure delivery of prescriptions, including controlled and non-controlled substances.